I don’t know about you, but I love a cool, rich Guinness every now and again. Particularly after St. Patrick’s Day, we usually have a few extra pints in the fridge, which was the inspiration for this recipe. Guinness also serves as the perfect beverage to complement this meal as well. The levels of flavor in this stew are robust and hearty and pair very well with cheesy grits. You can always omit the grits, but we really liked them together. My kids loved the meat in this stew, so it was perfect for the whole family. In a large stew pot (I use my enamel caste iron pot), melt the butter and add olive oil. Season the meat with salt and pepper and add to the pot. Brown on all sides and remove onto a plate. Set aside. Add onion, garlic, and mushrooms to the pot until the garlic is fragrant and the onions become transparent. You may need to add a bit more olive oil to the pot if it looks dry. Add Guinness, tomato paste, and chicken stock to the pot. Combine thoroughly. Add the beef back into the pot. Season with paprika and oregano. Bring to a boil. Cover and reduce the heat to simmer for 30 minutes. Add carrots to the pot, cover, and continue to simmer for another 30 minutes. Begin to prepare the grits at this point, with 30 minutes of cooking time remaining. Add corn grits and water to a small non-stick pot. Bring to a boil, reduce heat to simmer, and then stir occasionally for 25 minutes. Remove from the heat, add remaining ingredients and stir until smooth and creamy. 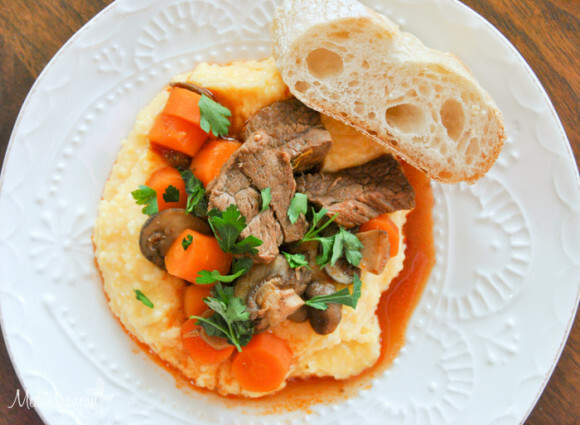 Serve stew over grits and top with fresh parsley.